In lawns grub damage causes irregular brown patches of grass. Increasing gradually over the season, the brown spots are most extensive by fall after a full season of grub activity. Suspect a grub problem where turf appears scorched. The sod lifts up easily in these spots because the roots have been destroyed. Other clues are evidence of moles or skunks digging and flocks of blackbirds, starlings, or perhaps even crows frequenting your lawn. Inspect for grubs early in the season by cutting a square-foot piece of sod to a depth of 4 to 5 inches on 3 sides and carefully peeling it up from the soil. Scrape the dirt from the roots and look for the white, curled larvae there or in the soil you’ve exposed. Then lay the grass back in place, tamp it, and water it in. A healthy lawn where grass has deep roots can withstand the activity of as many as 20 to 40 grubs per square foot in the spring when they are small, but in the fall even 10 to 15 grubs may do significant damage. If your grass is not healthy and dense any more than 10 grubs per square foot is a threat and 50 or more will likely destroy it by season’s end if they are not treated. Ornamental plants under attack by white grubs wilt suddenly and may die. This usually occurs in early summer. 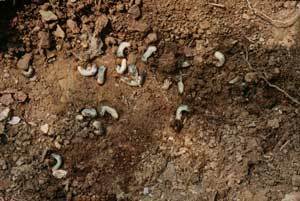 Grubs attack roots and bulbs of perennial plants such as iris, gladiolus and hyacinth when they’re planted in ground previously sodded with lawn grass. The adult beetles may also feed on the foliage. Occasionally grubs harm vegetables, too. They feed on the roots of corn, beans, peas and many other food crops. They feed on the roots of trees, but normally do little harm unless the tree is a newly planted seedling or sapling.